The committee said that as pavement parking is a devolved issue, the focus of the inquiry is England only. The Scottish Government's Transport (Scotland) Bill will introduce a national ban on pavement and double parking. The committee said that parking on pavements creates real problems and that for those with visual difficulties, who use mobility aids, or need to navigate footpaths with children, ‘unpredictable hazards such as cars represent a potential danger’. It added that councils also face costs to repair damage to surfaces that are not designed to take the weight of motor vehicles. Committee chair Lilian Greenwood said: ‘This is an area where some people’s actions cause real difficulties for others. 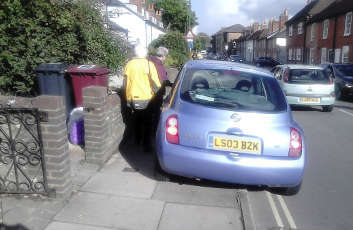 Parking on pavements risks the safety of all groups of people from the littlest to the oldest, with differing needs. RAC head of roads policy Nicholas Lyes backed the inquiry but said that the case for an outright ban is not clear cut and that the inquiry should look carefully at how to strike the right balance. The committee pointed out that a mix of criminal and civil sanctions are available to police and local councils to enforce restrictions on pavement parking on private or commercial drivers. Parking on footways or pavements was banned in London in 1974, and it is prohibited for large goods vehicles across England. But it added that a lack of progress in tackling the issue has led many groups to campaign on the issue but the Government has not taken any action on this issue in recent years. The closing date to submit written evidence is 14 May.